This library helps you to easily play with the almost universal 3 axis accelerometer available in most Hobby markets that is based on Freescale’s MMA7361. In order to get in working you have to pull-up the sleep pin using a 10K resistor to the 3.3V pin. All other connections are labelled. 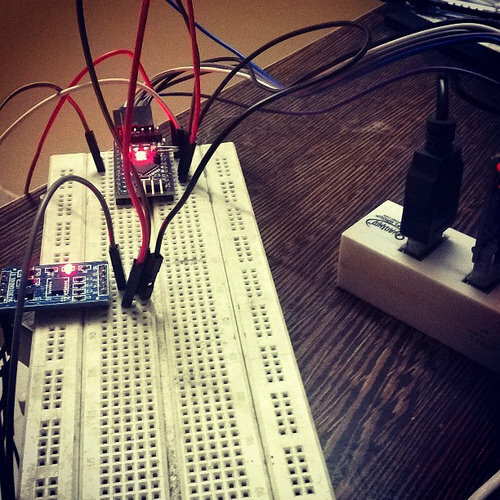 This entry was posted on Friday, November 14th, 2014 at 10:10 pm	and is filed under Arduino, library. You can follow any responses to this entry through the RSS 2.0 feed. You can skip to the end and leave a response. Pinging is currently not allowed. Hi, I am trying to use this library. I works great with one accelerometer, but the second keeps gets the same output.